Extend your Breeze Battery Life. E cigarette starter kits are great for all new vapers and, here at Cloudstix, we have handpicked a selection of the best. So, if you are just starting your journey into vaping, we can help to find the right starter kit for you. How to choose e cig starter kits? More and more people are vaping and e cigarette starter kits have increased massively in popularity over recent years. If you’ve decided to switch from smoking to vaping, you’ve come to the right place. Here at Cloudstix, we provide a wide range of e cig starter kits - including everything that you need to start your vaping journey. The e cigarette starter kits from Cloudstix are designed to meet industry standards, providing you with the peace of mind that they are safe to use. Any of the vape starter kits that we provide - including the Aspire K3 Starter Kit – are compatible with the ever-changing e cig technology, allowing you to purchase the latest products on the market. What are the benefits of e cig starter kits? Vaping is considered to be a healthier alternative to smoking. Switching from tobacco cigarettes to smokeless e cigarettes is less harmful to health. The vape starter kits available to purchase at Cloudstix ensure that you have all the essentials you need to start vaping straight away. The vape starter kits are supplied with simple instruction manuals to make it easy for you to use. In addition to this, Cloudstix professionals are always on hand to provide advice and support. So, if you have any uncertainty about the way your vape starter kit works, be sure to get in touch with us. 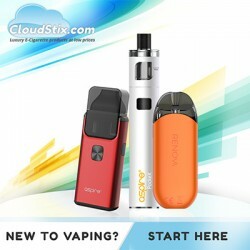 What e cig starter kits are available at Cloudstix? Here at Cloudstix, we aim to provide something to suit everyone - which is why we provide a wide range of vape starter kits from leading brands such as Aspire and Vaporesso. Within the section below, you’ll find e cig starter kits with have a high quit ratio, where customers have successfully used them to quit smoking. The Aspire Breeze Kit is just one of our e cigarette starter kits that will make it easier for you to switch from tobacco smoking to vaping. Aspire Breeze Kit FINAL REDUCTIONS NOW ACTIVE U.. Aspire X30 Rover Kit The perfect stealth, mouth..